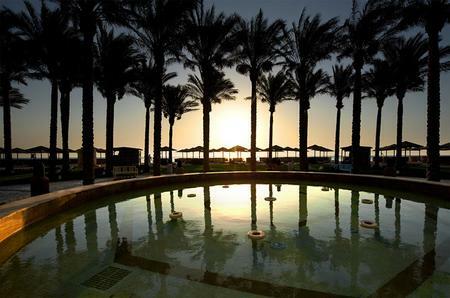 Part of a holiday village created by a number of hotels, the Grand Makadi sits on the northern side of Makadi Bay in a beautiful beachfront location just 25km from the airport and 35km from the town of Hurghada. and mini-bar, both at extra charge. JUNIOR SUITES are larger than a standard room,have a lounge area, balcony or terrace with garden view, and sleep 2 adults and 2 children or 3 adults. Upgrade from £4 per room per night. JUNIOR SUITES with POOL VIEW upgrade from £5 per room per night. JUNIOR SUITES with SEA VIEW upgrade from £9 per room per night. A gently sloping private beach runs the length of the hotel. There are some coral areas – beach shoes are recommended. There is jetty access to the house reef for snorkelling. Sun loungers, parasols and beach towels provided.